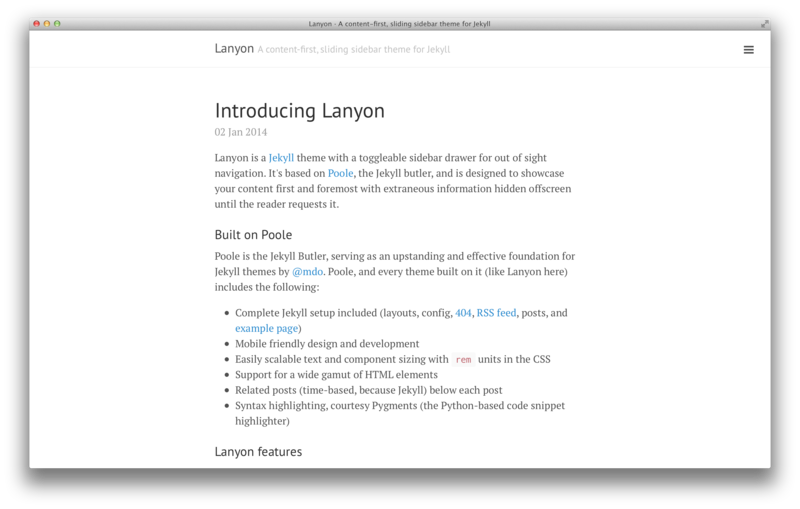 Lanyon is an unassuming Jekyll theme that places content first by tucking away navigation in a hidden drawer. It’s based on Poole, the Jekyll butler. 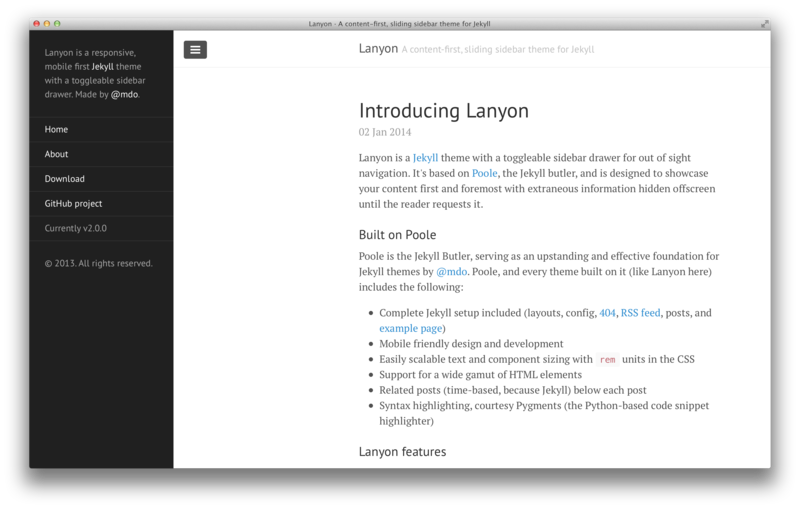 Lanyon is a theme built on top of Poole, which provides a fully furnished Jekyll setup—just download and start the Jekyll server. 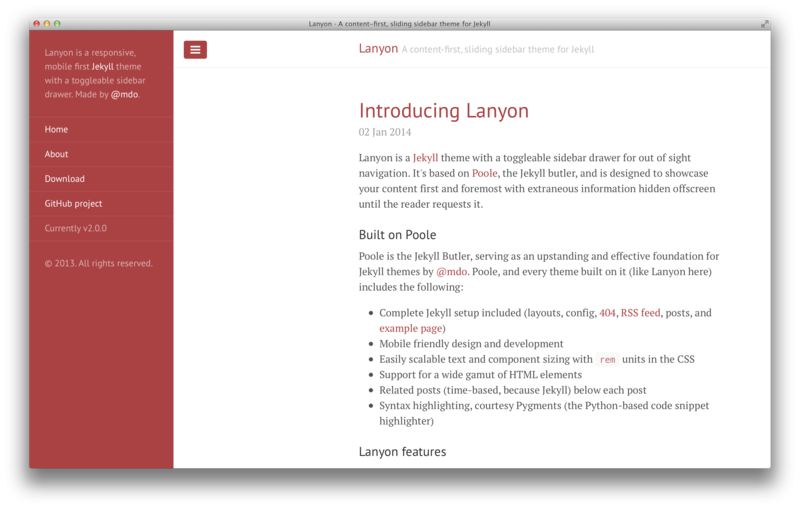 See the Poole usage guidelines for how to install and use Jekyll. Lanyon includes some customizable options, typically applied via classes on the <body> element. 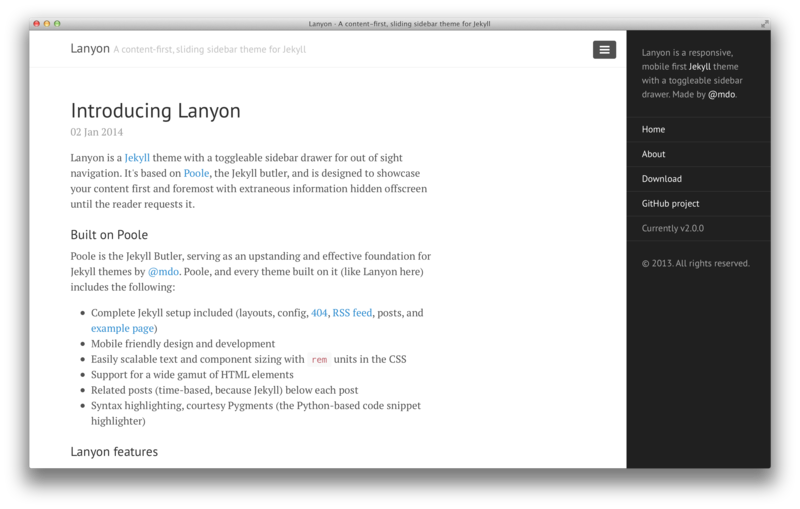 Create a list of nav links in the sidebar by assigning each Jekyll page the correct layout in the page’s front-matter. Why require a specific layout? Jekyll will return all pages, including the atom.xml, and with an alphabetical sort order. To ensure the first link is Home, we exclude the index.html page from this list by specifying the page layout. Lanyon ships with eight optional themes based on the base16 color scheme. Apply a theme to change the color scheme (mostly applies to sidebar and links). Reverse the page orientation with a single class. Lanyon has two branches, but only one is used for active development. master for development. All pull requests should be to submitted against master. gh-pages for our hosted site, which includes our analytics tracking code. Please avoid using this branch.